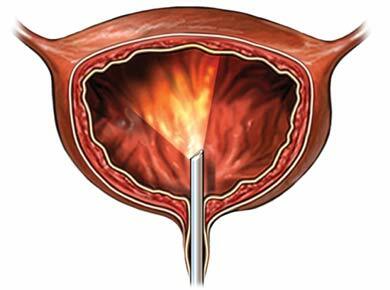 A cystoscopy is a procedure to examine the bladder with a lighted scope. The scope allows the doctor to look through the urethra and into the bladder. The urethra is a tube that carries urine from the bladder to the outside of the body. This procedure is usually done in your doctor's office. Local anesthesia is used to numb the area in and around the urethra. A sedative may also be given to help you relax. You will lie on an exam table. A cystoscope will be inserted through the urinary opening, into the urethra, and into the bladder. Your bladder will be drained of urine. A sample will be kept for testing. Next, your bladder will be filled with sterile water or saline solution. This will allow a better view of the bladder walls. The bladder and urethra will be examined. Local anesthesia will keep you free from pain. You may feel some discomfort or the urge to urinate when the bladder is filled during the exam. After the procedure, you may experience a burning sensation or see small amounts of blood when you urinate. Cystoscopy. Urology Care Foundation website. Available at: http://www.urologyhealth.org/urologic-conditions/cystoscopy?article=77. Accessed March 7, 2018. Cytoscopy & ureteroscopy. National Institute of Diabetes and Digestive and Kidney Diseases website. Available at: http://kidney.niddk.nih.gov/kudiseases/pubs/cystoscopy. Updated June 2015. Accessed March 7, 2018.